Utilize space along an embankment by creating a flower-filled, vibrant and colorful design bursting with lush plants and ground cover. Plants nestled along the sloped area of an embankment not only provide a showy display but help to prevent erosion as well. Adding a meandering pathway through the garden also helps to provide a resting spot to admire the plants. Perennial flowers require a one-time planting to grow back each year taller and stronger than before. Grown in a wide range of shapes, sizes and blooms colors, they help to create a permanent addition to an embankment garden. When creating the garden, take into account drainage, light and existing plants. For example, perennial flowers like lavender, Russian sage and coreopsis all thrive in well-drained soil and tolerate a steep or slightly sloped embankment. They are also drought-tolerant, which makes them good plants to grow if the embankment receives full sun throughout the day. 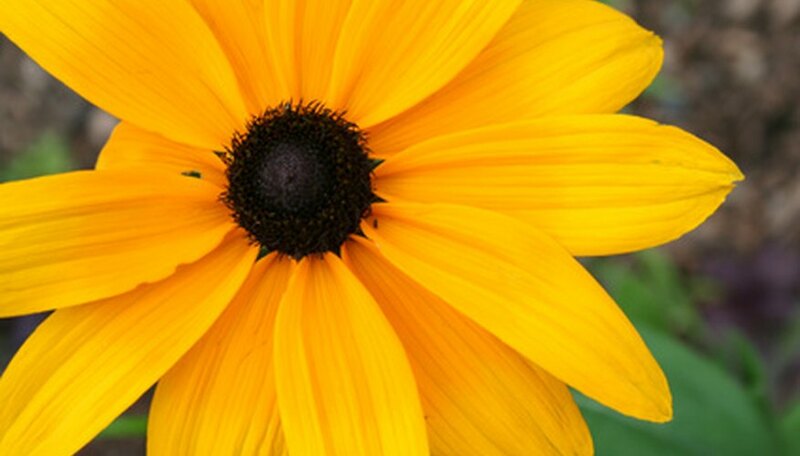 Flowers like purple coneflower and black-eyed Susan withstand a wide range of soil varieties, including poor soils like high clay or sandy soils. Amending the embankment soil with a 2-to-3-inch layer of compost promotes a healthy start to plant growth. Low-growing perennials like verbena are attractive along embankments because of their trailing, creeping growth habit. Tuck these perennials around the front of the embankment to fill out the bed. Connect areas of the embankment together -- like a perennial garden to a sunken patio -- by creating a garden staircase. Built from a wide variety of weather-resistant and durable materials that include flagstone, brick, slate and concrete, embankment staircases create an inviting focal point to the area and draw your eye into the space. Slate is an ideal stone to use because of its stacking ability and flat, sturdy structure. The dramatic colors found within slate -- deep grays, rich purples and dramatic blues -- make for an attractive staircase within the embankment. A normal-size staircase for an embankment is at least 2-to 3-feet-wide. This stairway eases pruning, weeding and watering nearby flowerbeds and allows maneuvering gardening equipment like wheelbarrows throughout the garden. Evergreen ground cover and shrubs help to provide constant height, color and texture to the hillside landscape. Because they keep their foliage color all year long, these plants keep the hillside in color during winter, when many plants have died down for the season. Evergreen ground covers such as cranberry cotoneaster and creeping liriope are excellent for bank cover because they help to hold the soil within the sloped landscape and fill in areas with their vibrant green foliage. Cranberry cotoneaster, a drought-tolerant ground cover, has deep green foliage that casts a bronze to red tinge in winter. A steep or slightly sloped embankment is also a goodl location for creeping ivies and junipers. Evergreen shrubs like boxwood, cedar and camellia add height to the embankment and provide year-round color.